Samy’s, famous for its fish head curry, started more than half a century ago as a hawker center stall. I go to Singapore to eat. This city-state, an island off the coast of Malaysia, is a melting pot of cultures and cuisines. 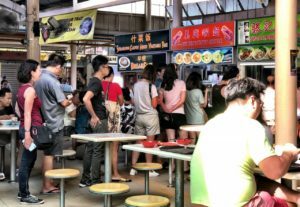 And its legendary hawker centers, with dozens of side-by-side stalls serving up Chinese, Malay and Indian fast food, are a grazer’s paradise. There’s even a movement afoot to designate them Unesco Heritage sites. As a gateway to Southeast Asia, Singapore has been my first or last stop on many visits to this region, and each time I rely on local recommendations to help direct me to what they consider to be the best eats. In Singapore, it seems, everyone is a self-appointed food critic. My latest visit, for five days in March, was no exception. While traveling in Laos one month earlier, I had met several Singapore residents, and asked them about their favorite hawker food. Once in town I greatly expanded this list based on conversations with cabdrivers who shuttled me around. This was a mode of transportation I hadn’t used on previous trips. Singapore has an excellent public rail system, known as the MRT. But since my last visit, the ride-hailing service Grab has made it much easier to zip around this sprawling city. And for just a bit more than two MRT fares, my husband and I could get from one hawker center to the next more quickly. As we traveled above ground, feeling a bit like Rip Van Winkle, and gaped at the skyscrapers that had proliferated since our last visit, we questioned each driver about the best places to eat. Unlike in some other Asian cities, there’s no need for concern about their getting what is euphemistically known as “tea money” for steering tourists to particular restaurants. Yet they literally – and figuratively – have been around the block. Though personal preferences varied, they agreed about this much: Singapore has become an expensive place, and for the best values one should avoid tourist establishments. This included those serving black pepper crab and chili crab, which locals consider luxuries, as well as steamboat – a boiling pot with a tube in the center, placed over a gas flame and used to cook food (generally fish) at the table. Our money would go further and we would have a more authentic experience, they said, if we got away from the civic area and Marina Bay, where many hotels (including ours) were situated. Following that advice, we expanded our horizons to residential neighborhoods, where our average tab for hawker food ran about $25 per day. Here’s where we went and what we ate. En route here early on a Saturday morning, our Grab driver warned us to be prepared for the long queues, but we were undeterred. A Singaporean whom we met in Laos had portrayed this place as a food mecca, and we had brought our appetites. Her recommendations could have kept us noshing for days, on local specialties from barbecued stingray to carrot cake. Cai dao kueh, as this Chinese concoction is called, bares no resemblance to the sweet dessert with cream cheese frosting that we get back home. In fact, it’s a savory main course, consisting of rice cake cubes fried with dark soy sauce, embellished with eggs and bits of oysters and prawns. In a so-called white version, white radish is part of the mix. Standing in line for half an hour, I had plenty of time to contemplate the options, and decided on the fish maw (dried fish bladder), which cost the equivalent of about $7.50. Considered a luxury, it is more about texture than taste, since it absorbs flavors of the surrounding ingredients. In this case it was immersed in an earthy, cloudy broth made of long-simmered pork bones. A fried egg, pieces of liver, bean sprouts and herbs are added to the bowl just before serving. The so-called dry egg noodles come in a separate bowl. They’re dunked for ten seconds in steaming water, then topped with mushroom sauce and a dash of chili. Together these two bowls spell absolute bliss. While I waited my turn for Chinese fish maw, my husband, before securing a table, had stopped by Aliff Nasi Lemak (Stall 01-27) and ordered up a traditional Malay breakfast. Nasi lemak is a mound of rice that has been cooked with coconut milk, and is surrounded on a plate by small portions of such protein sources as chicken or fish. The arrangement typically includes a pile of ikan bilis – tiny dried anchovies – an egg and spicy sauce called sambal. Aliff’s send-up of this traditional dish was most memorable for the quality of the ikan bilis and the rice. Unlike most stalls, they used basmati rice, which is longer grain, fluffier and more expensive. It tasted strongly of coconut milk, as it should. Both these stalls, like many others at Serangoon, are closed on Mondays, which is generally not a good day to visit hawker centers because so many vendors take the day off. Whenever you go, it’s advisable to take your own tissues or Wet Wipes; napkins are not supplied, though there is a sink in the middle of the food court where you can wash your hands before or after your meal. Though we took a Grab all the way to Serangoon Garden Market & Food Centre, an alternate route is to ride the MRT to Lorong Chuan station and summon a Grab for the rest of the trip. We were more dehydrated than hungry when we arrived here on a steamy Saturday afternoon after a visit to the Botanic Gardens. The Grab driver who took us to the gardens had told us about this hawker center, which is situated just a five-minute walk (across Dunearn Road via an overpass) from the gardens’ Bukit Timah Gate (and the Botanic Gardens MRT station). And we found it the perfect place to cool off during the heat of the day. Freshly squeezed sugarcane juice from The Sugarcane Plant (Stall 01-30), served over ice with a spritz of lemon, was light and refreshing, but we didn’t stop at that. Next door, at Teck Kee Hot & Cold Dessert (Stall 01-31), we ordered an ice kachang. Made to order: Juices at The Sugarcane Plant are freshly squeezed. It’s a shaved-ice dessert, Malaysian in origin, that used to be made with a hand-cranked machine but is now prepared with an electric one. 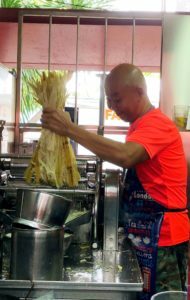 At its base are the confections of your choice – for example, red beans, sweet corn and cendol (made from green-pea flour and pandan leaves, it looks like green slime). Next comes a mountain of ice. On top of that go sweet syrups – not necessarily in naturally occurring colors – and, finally, a healthy helping of sweetened condensed milk. Not for calorie counters, these treats are so commonly shared that they’re typically served with two spoons. While lingering over one of them, we noticed a snaking line nearby, at Selera Rasa Nasi Lemak, and resolved to go back once our appetites had revived. 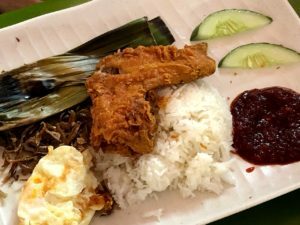 Selera Rasa Nasi Lemak is reportedly the Sultan of Brunei’s favorite breakfast when he’s in Singapore. “Stall 2?,” our Grab driver asked the next day as he confirmed that we were headed (back) to Adam Road Food Centre. How did he know? We later discovered that their nasi lemak is reportedly the Sultan of Brunei’s favorite breakfast when he’s in Singapore. I’m assuming he doesn’t wait in line 23 minutes for it, as we did, though. The rice wasn’t quite as good as Aliff’s, but everything else on the plate, including the peanut sauce, was better. The version we ordered – Set F – was called the Royal Flush and cost 5.40 Singapore (SND), or about $4. In addition to an egg over easy and ikan bilis, it included two perfectly crisp deep-fried chicken wings; a potato patty about the size of a silver dollar; and spicy otah – fish paste steamed in a banana leaf. The only thing I would do differently would be to eat my Royal Flush first, in the morning (the stall opens at 7 a.m.), and go directly to the Botanic Gardens, while it’s still relatively cool, to walk it off. On the subject of fish heads, Singaporeans divide into two camps: those who prefer them cooked Chinese-style, in sweet-and-sour sauce, and those who favor the Indian version, which is curried. For those in the second category, the place at the top of every cabdriver’s list is Samy’s, a family-owned establishment that started more than half a century ago as a hawker center stall. It’s by no means the only place to eat fish-head curry in Singapore. But tourists and locals flock to this restaurant, in a lush tropical setting near the Botanic Gardens. For some reason the former seem to reserve the outdoor tables, while the latter eat indoors, in what resembles an Indian dining hall with long tables, high ceilings and swirling overhead fans. One fish head, served in a clay pot and swimming in several cups of a rich coconut curry, is enough to feed two – the appeal of this part of the fish is that it’s so meaty. The only thing you must decide is whether you want white rice or biryani rice to accompany it. In lieu of plates, the food is served on a banana leaf the size of a place mat. 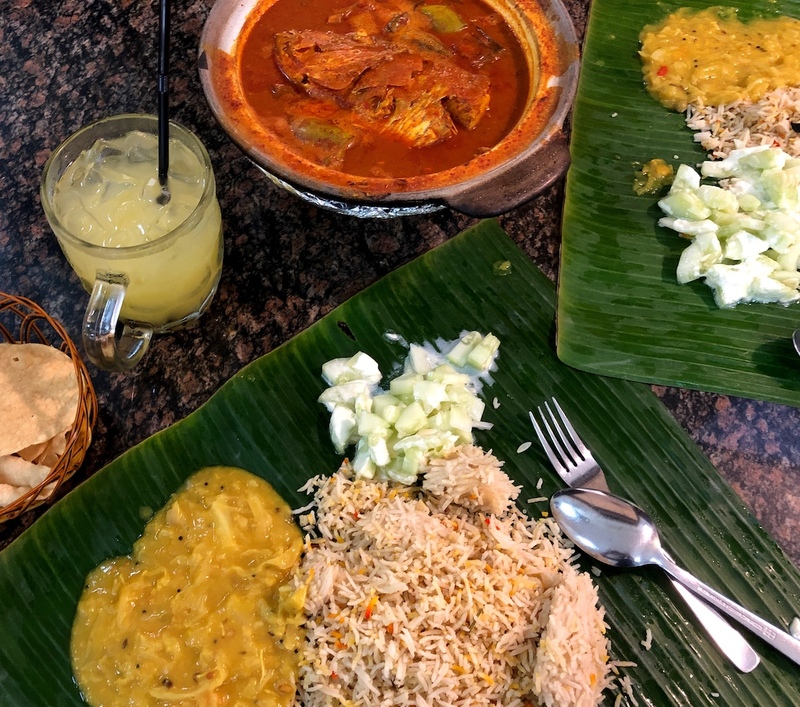 After you’ve placed your order, a waiter swiftly appears with three metal pails, from which he ladles rice, cucumber salad and dal – simmered lentils seasoned with spices – onto the banana leaf. The curry and a basket of papadum (lentil chips) arrive at the table soon after. If fish-head curry doesn’t appeal, Samy’s has a wide-ranging menu of familiar northern and southern Indian fare. In any event, don’t miss their freshly squeezed lime juice, which is a house specialty. Dinner for two, with drinks, cost us 25 SND, or about $18.50. Samy’s is closed on Tuesdays. This hawker center was another Grab-driver recommendation that I doubt we would have discovered on our own. The bad news is that we didn’t get there until our last day in Singapore, which happened to be a Monday, when many stalls around the city are closed. The good news is that the meal we ate there, at one of the few open ones, was the best we had on our latest visit. Situated in a building designed like a Malay longhouse, this market is in the heart of Singapore’s Malay community. (“Serai” is the Malay word for lemongrass.) On the first floor is a wet market. Upstairs is a clothing bazaar and food court, where we queued up at Sinar Pagi Nasi Padang (Stall 02-137, open until 3:00 p.m.) for a savory morning meal. “Pagi” means morning in Malay, and “nasi padang” refers to a meal of rice surrounded by a selection of meat, fish, eggs and vegetables. It’s basically a buffet on a plate or, as is often the case, a banana leaf. Geylang Serei Market, in a building designed like a Malay longhouse, is in the heart of Singapore’s Malay community. Here’s how it works at Sinar Pagi Nasi Padang: You tell the server which starch you prefer: white rice, fried rice or lontong – a compressed rice cake steamed in a banana leaf and cut into slices or cubes. Then point to the other dishes you want, from among about two dozen on display in the stall window. Since this is a halal stand, none of the offerings will include pork. When asked, “Spicy?,” your yes-or-no answer will determine which sauce gets served on top. Prices are somewhat discretionary, based on how many things wind up on your plate. Grilled fish was at the center of my husband’s plate. I opted for chicken rendang – simmered with spices and coconut milk. That, plus the side dishes and sauces, turned into an enormous and absolutely delicious breakfast for the two of us that cost 12 SND, or $8.85. “That’s a good price,” said the man at the next table, who was there having breakfast with his wife and grandson. After 20 minutes of chitchat, we discovered that he owns a restaurant on Arab Street, near our hotel, where, he said, “I basically serve the same food but in a fine-dining experience.” And it costs twice as much. Before going to work, he said, he has his morning meal every day at Geylang Serei Market. For the evening meal, the most convenient place for Singaporeans to consume hawker food is near where they live. And often that means at a food court in the middle of an apartment block. It’s hard to pin locals down about exact addresses – perhaps because they are reluctant to send tourists to the outskirts of the city when there’s so much good food available elsewhere. But for sheer selection and local color, a trip to Bendemeer Market & Food Centre is worth the journey. Having eaten good and in pursuit of better, we took the MRT to Boon Keng (northeast line station 9) and emerged from exit B at about 6 p.m. Though we had an address in hand, once we saw the signs to the Bendemeer Market & Food Centre, we diverted. 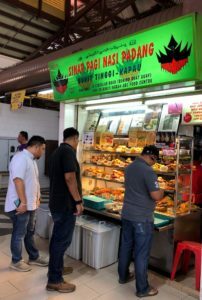 About 30 yards from the MRT station was the food center, with many dozens of tantalizing stalls, and Singaporeans ordering their evening repast to eat there or carry out. Still hankering for chicken rice, we located a stall with a queue – as always our measure of a popular place. It was at least as good as the chicken rice we ate at a small restaurant near our hotel, only at the people’s place it cost less than half as much. The cabdriver was indeed right. There is no bad chicken rice in Singapore. Deborah L. Jacobs, who has traveled extensively in Southeast Asia, is the author most recently of Four Seasons in a Day: Travel, Transitions and Letting Go of the Place We Call Home. Follow her on Twitter at @djworking and join her on Facebook here. You can subscribe to future blog posts by using the sign-up box on her website’s homepage. Singapore just went up on my need to “eat there” list!